It looks like things are moving forward here in Waikoloa Village for the Waikoloa Plaza project. For many years it seemed that having another shopping plaza in Waikoloa was nothing more than a dream. Then something almost beyond belief happened. A sign was erected with actual plans for a shopping plaza. It was pretty vague as to who would actually be moving in but an exciting prospect just the same. Just this week this sign appeared. I am beyond excited to see all of the great businesses that we will have here in Waikoloa Village. The very thought of not having to drive to Waimea for a hardware store makes my heart happy. Being married to a carpenter can be a blessing and a curse as we are closing out year number 10 of our home remodel. 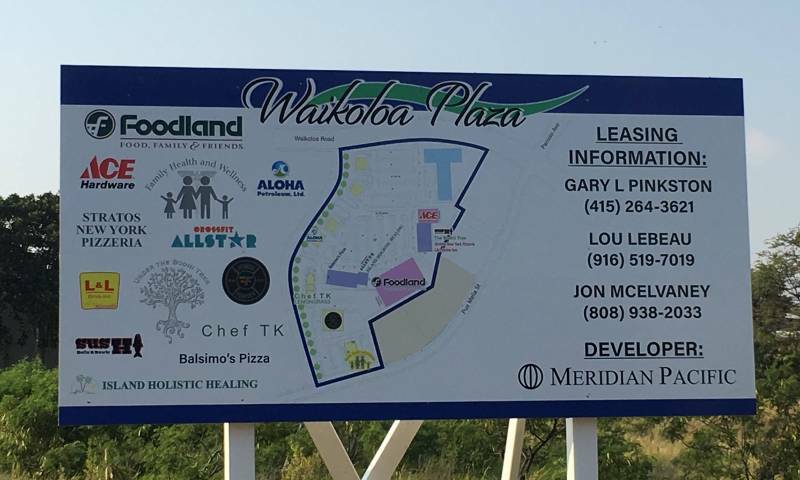 We still do not have an ETA on this plaza, but I am hoping that the fact that there are actual businesses on this new sign is a positive step in the right direction. I am thrilled as my husband and I will be moving to the village by the end of the year. More options in closer proximity will cut down on our daily commute. This will increase the walk factor and make us healthier walking to and from the plazs. Let me be the first to prematurely welcome you to the Village. My family and I love living here as it is so central to everything. Mahalo Linda for the warm welcome. We’re looking forward to new adventures and I hear positive things about the Village. We’re also excited about meeting new people; I’m sure we’ll become friendly with the Highlands regulars! That would be SO great! We “time-share” at Paniolo Greens every other year and have decided to move to Hawaii Island in the next few years. What’s kept us from considering Waikoloa instead of North Kohala or Waimea is lack of shopping options and prices at the only grocery. Now there are nice, new homes and townhomes going in and–hopefully–this second shopping center. Yay! I agree, it is going to be wonderful to have more options here in the Village.